exPress-o: Secret Spot in Paris! Have you ever been to Paris? If you're planning a spring trip you should check out this little secret spot just behind the Notre Dame. I've been daydreaming about it ever since I read it on Carin's blog! Supposedly if you take a walk behind the cathedral, you will enter a park full of fluffy, pink blooming trees. They last about a week or so but if you catch them in full bloom, the view will blow you away. Ah, don’t you just want to board a plane right about now? I do! P.S: Ah, also equally stunning vintage Paris and the city of light during autumn. not yet, but someday the city of lights. oh my, those trees are heavenly. Yes, I would love to board a plane. Have a great wednesday! Oh, I've been there... it was amazing! It is a beautiful little hideaway! 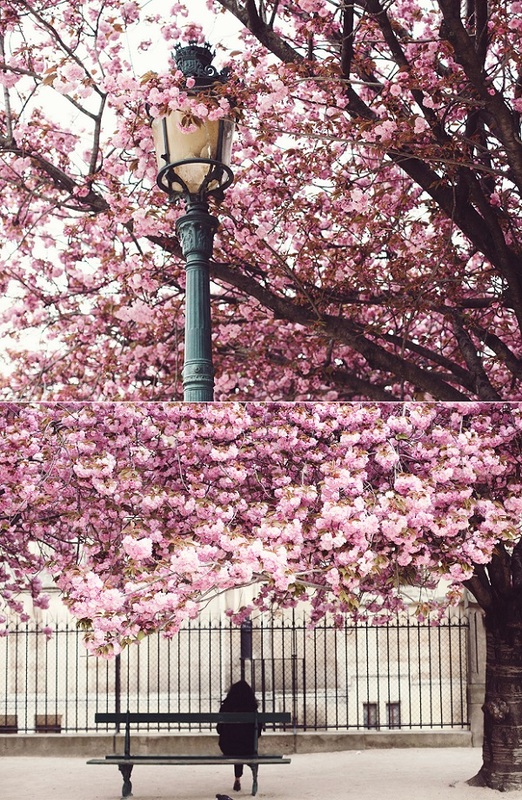 I was in Paris a few weeks ago and the trees were JUST starting to bloom. A lovely spot to sit and take in the beauty of the cathedral and the river. How awesome, Katie:) You totally should go back with your husband. So romantic! Steph, thanks for the link..Off to check it out!